Bob and Julie bring years of experience to work in schools. Julie taught 2nd and 4th grades in the St. Paul and White Bear Lake schools. 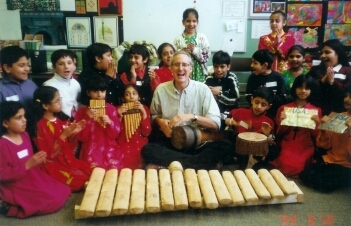 Bob has worked in schools across the country and abroad as an artist-in-residence and did research on music education for his doctorate (University of London, 2002). Artist-in-residence programs with Bob and Julie include lots of partcipation: dancing, singing, and moving to music. In addition, they bring their broad experience and scholarship to classrooms providing depth and perspective.